Aug - 24 | By: Levi J. Anderson | one comment. 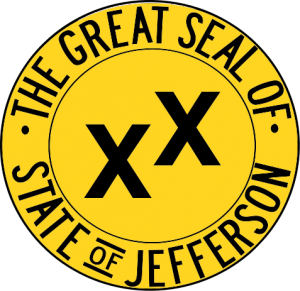 A region of the Pacific Northwest that has imagined its own independence as far back as the 1850’s, the ‘mythical’ 51st State of Jefferson, is a proposed U.S. state that would span the contiguous, mostly rural area of southern Oregon and Northern California. Many a liberated spirit claim this State their home, and as of the 2010 US Census, if the Jefferson counties were a state, the state’s population would be 457,859 and be roughly the size of West Virginia. As Summer turns to Autumn in this neck of the woods, independent film fans and creators have two film festival opportunities to celebrate the art and entertainment of their local industry. Brought together by the Scott Valley Film Coalition, this festival will be held at the REC (Resource and Event Center), 11236 Hwy 3 – Ft. Jones, CA. 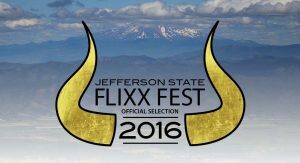 See the schedule and list of films at FlixxFest.org. The Klamath Independent Film Festival unofficially celebrates The State of Jefferson from Sept. 30 – Oct. 2, with a showcase of filmmakers from counties on the California/Oregon border (Klamath, Lake, Jackson, Josephine, and Curry counties of Oregon. Siskiyou, Modoc, and Del Norte counties of California). The KIFF will be held at the Ross Ragland Theater, 218 N. 7th St., Klamath Falls, OR. In fact the KIFF 2016 Headlining Film is the “… future noir set in the rebel State of Jefferson in 2029” called Black Road, the third feature film from Southern Oregon duo Anne and Gary Lundgren, of Joma Films. 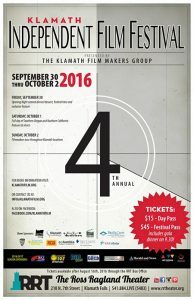 Full schedule and list of films available at KlamathFilm.org.